Wanda-mere Lightning, English-bred Shire Horse. ASHA #22943-M. Click to see Wanda's pedigree. 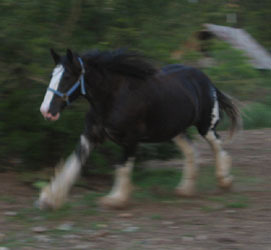 Wanda is a gorgeous black Shire mare with unusual sabino markings. Her conformation and action are excellent, and she is a grand-daughter of the famous Edingale Mascot. Wanda stands an honest 17.2hh barefoot. She foaled a handsome colt full of personality and already showing feather! Click here to see Guinness and Wanda's newest Arrival! 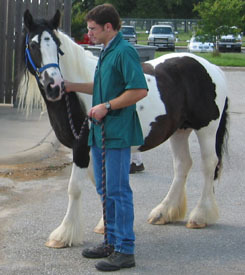 Fashion Laddie's Cindy, black Clydesdale. CB USA #14160. Click here to see Cindy's pedigree. 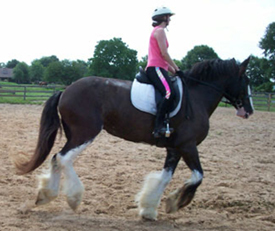 Cindy is a very well-bred black Clydesdale mare with wonderful, up-headed movement. 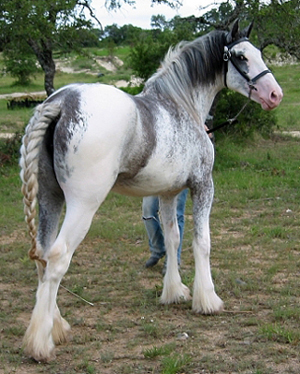 She stands 17.2hh, and is trained to 2nd level in dressage. 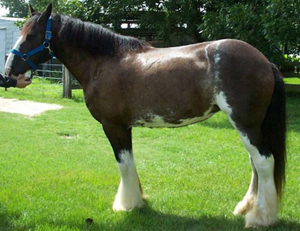 Cindy's grand-sire is the Canadian bred Clydesdale, Classic Laddie. Magnolia Draft Horse Ranch, LLC. Magnolia's Annabella, flashy Fox Valley Shire Horse. GCDHA# FDD011060MPS Click here to see Bella's pedigree. 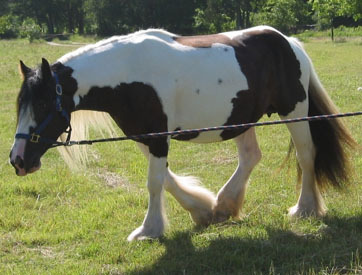 Magnolia's Annabella is a rare maximal sabino marked black Shire mare standing 17hh. 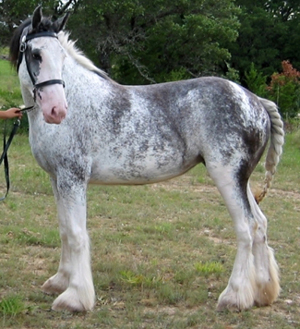 She is registered as a Foundation Drum Horse because she has the perfect size, feather, and color to meet the breed description. Click here to see Magnolia's First Lady! 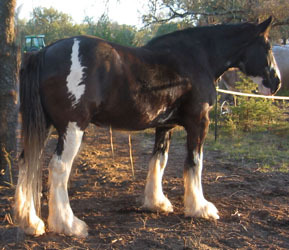 Clononeen Sanas, imported Gypsy Vanner Horse. GVHS#GV00086F Click here to see Sanas's pedigree. Sanas was imported for us by Epona Stables, from Clononeen Farm in the UK. Sanas stands a traditional 14.3hh and has the "total package"--breathtaking movement, feather, disposition, and conformation!